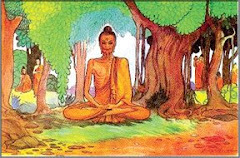 At one time the World-Honored One was dwelling in the Anāthapiṇḍika Garden of Jetavana Park in the city kingdom Śrāvastī, together with a group of 1,250 great bhikṣus. 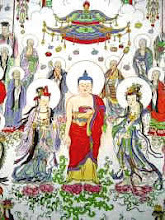 As recognized by the multitudes, all of them were great Arhats who, with no more afflictions, had ended their discharges, acquired benefits for themselves, and totally liberated their minds. Also to the assembly to hear the Dharma came honored Bodhisattva-Mahāsattvas with vast wisdom and sublime virtues, complete in their majestic deportment. 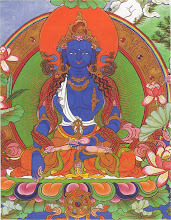 At the head of the assembly was Great Wisdom Mañjuśrī Bodhisattva-Mahāsattva. At that time Śākyamuni Buddha sympathetically considered all the sentient beings that would live a short life in future times. In order to let them acquire the great benefit of increased lifespan, He decided to pronounce, for their sake, the inconceivable, secret, profound, subtle, victorious Dharma. 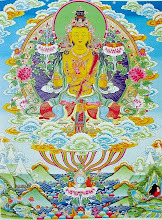 At that time the World-Honored One said to Great Wisdom Mañjuśrī Bodhisattva, "All of you, hearken! Going west from this southern continent, Jambudvīpa, passing countless Buddha Lands, there is a world named Immeasurable Store of Virtue. That land is magnificent, adorned with multitudinous treasures, pure and superb, peaceful and joyous, foremost in exquisiteness, surpassing all the lands in the ten directions. In that world of Immeasurable Store of Virtue is a Buddha named Infinite-Life Resolute Radiance King Tathāgata, who has realized anuttara-samyak-saṁbodhi. He is now living in that world. 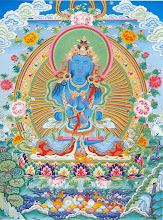 Exuding great lovingkindness and compassion, He expounds the wondrous Dharma for the sake of sentient beings, enabling them to acquire excellent benefits, peace, and joy." Moreover, the Buddha said to Mañjuśrī Bodhisattva, "Now in this world of Jambudvīpa, the human lifespan is 100 years, but many commit evil karma and die prematurely. Mañjuśrī Bodhisattva, if there are sentient beings that have seen this Sūtra of the Infinite-Life Resolute Radiance King Tathāgata Dhāraṇī and heard the name of this Tathāgata, their virtue will be superb. Suppose they accept and uphold this Sūtra of the Infinite-Life Resolute Radiance King Tathāgata Dhāraṇī. 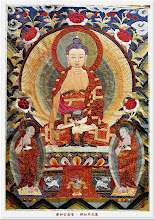 It matters not whether they themselves have copied it or have had others copy it, whether they enshrine the Sūtra in their own houses, in tall buildings, or in the halls of ashrams, or whether they read and recite it, honor it, make obeisance, or give offerings to it of various kinds of wonderful flowers, incense for burning, powdered incense, solid perfumes, garlands, and so forth. If those who expect to live a short life can copy, uphold, read and recite this Sūtra, and give offerings and make obeisance to it with an aspiring mind, such individuals will be able to increase their lifespan to 100 years. "Furthermore, Mañjuśrī Bodhisattva, if there are sentient beings that have heard the name of the Infinite-Life Resolute Radiance King Tathāgata and can recite his name 108 times with an aspiring mind, the short lifespan of such sentient beings will be extended. If there are those who have only heard His name and believe, accept, and honor it with an aspiring mind, such individuals can also have an increase in their lifespan. "Mañjuśrī Bodhisattva, if there are those who themselves copy or have others copy this 108-syllable Dhāraṇī of the Infinite-Life Resolute Radiance King Tathāgata or who enshrine this Dhāraṇī on the top of a tall building or at a pure, clean place in the hall, adorn it according to the Dharma, and make various kinds of offerings, such individuals who expect to live a short life will be able to gain longevity, fulfilling the lifespan of 100 years. Individuals such as these, after their lives have ended here, will be able to be reborn in the Buddha Land of that Infinite-Life Resolute Radiance King Tathāgata, the world of Immeasurable Store of Virtue." When Śākyamuni Buddha was pronouncing this Sūtra of the Infinite-Life Resolute Radiance King Tathāgata Dhāraṇī, there were 99 koṭi Buddhas who, with one mind and in one voice, also pronounced this Sūtra of the Infinite-Life Resolute Radiance King Tathāgata Dhāraṇī. And meanwhile, there were 84 koṭi Buddhas who, with one mind and in one voice, also pronounced this Sūtra of the Infinite-Life Resolute Radiance King Tathāgata Dhāraṇī. And meanwhile, there were 77 koṭi Buddhas who, with one mind and in one voice, also pronounced this Sūtra of the Infinite-Life Resolute Radiance King Tathāgata Dhāraṇī. And meanwhile, there were 66 koṭi Buddhas who, with one mind and in one voice, also pronounced this Sūtra of the Infinite-Life Resolute Radiance King Tathāgata Dhāraṇī. And meanwhile, there were 55 koṭi Buddhas who, with one mind and in one voice, also pronounced this Sūtra of the Infinite-Life Resolute Radiance King Tathāgata Dhāraṇī. And meanwhile, there were 44 koṭi Buddhas who, with one mind and in one voice, also pronounced this Sūtra of the Infinite-Life Resolute Radiance King Tathāgata Dhāraṇī. And meanwhile, there were 36 koṭi Buddhas who, with one mind and in one voice, also pronounced this Sūtra of the Infinite-Life Resolute Radiance King Tathāgata Dhāraṇī. And meanwhile, there were 25 koṭi Buddhas who, with one mind and in one voice, also pronounced this Sūtra of the Infinite-Life Resolute Radiance King Tathāgata Dhāraṇī. And meanwhile, there were koṭis of Buddhas as numerous as the sands of ten Ganges, who, with a unanimous mind and voice, also pronounced this Sūtra of the Infinite-Life Resolute Radiance King Tathāgata Dhāraṇī. 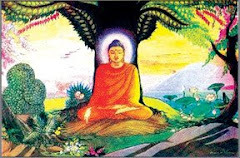 [The Buddha continued,] "Furthermore, if there are those who themselves copy or have others copy this Dhāraṇī Sūtra, such individuals will never fall to hell, the ghost world, the animal kingdom, or the dominion of Yama, lord of the underworld. They will never again undergo the evil retributions of those evil life-paths. 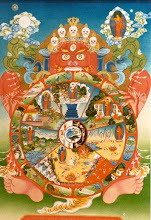 Individuals such as these, because of their virtue from having copied this Sūtra of the Infinite-Life Resolute Radiance King Tathāgata Dhāraṇī, will have past-life knowledge, continuing rebirth after rebirth, life after life, wherever they will be reborn. If there are those who themselves copy or have others copy this Sūtra of the Infinite-Life Resolute Radiance King Tathāgata Dhāraṇī, the virtue achieved by such individuals will be no different from that of copying 84,000 Dharmas in store. 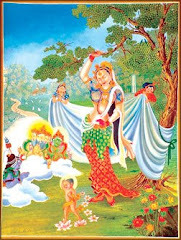 If there are those who themselves copy or have others copy this Sūtra of the Infinite-Life Resolute Radiance King Tathāgata Dhāraṇī, the virtue achieved by such individuals will be no different from that of constructing 84,000 treasure pagodas. 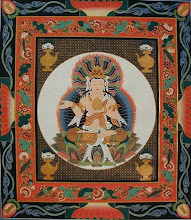 If there are those who themselves copy or have others copy this Sūtra of the Infinite-Life Resolute Radiance King Tathāgata Dhāraṇī, because of this virtue, their karma, if any, of falling to the five hells of uninterrupted suffering, will all be expunged. If there are those who themselves copy or have others copy this Sūtra of the Infinite-Life Resolute Radiance King Tathāgata Dhāraṇī, such individuals will not fall under the rule of the māra-king and his retinue or walk the life-paths of yakṣas and rakṣasas. They will not die accidental deaths and will never receive those evil retributions mentioned above. 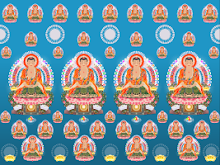 If there are those who themselves copy or have others copy this Sūtra of the Infinite-Life Resolute Radiance King Tathāgata Dhāraṇī, 99 koṭi Buddhas will appear before such individuals at the end of their lives, to receive them to be reborn in the land of that Buddha. You should not doubt what I say. 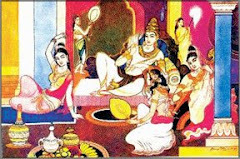 If there are those who themselves copy or have others copy this Sūtra of the Infinite-Life Resolute Radiance King Tathāgata Dhāraṇī, such individuals will never assume a woman's body in their future lives. 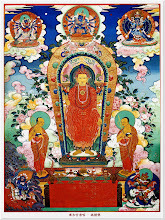 If there are those who themselves copy or have others copy this Sūtra of the Infinite-Life Resolute Radiance King Tathāgata Dhāraṇī, such individuals will constantly be followed and protected invisibly by the four god-kings: in the east is lord of gandharvas, the god-king Upolding the Kingdom; in the south is lord of kumbhānḍas, the god-king Increase and Growth; in the west is lord of great dragons, the god-king Broad Eye; and in the north is lord of yakṣas, the god-king Hearing Much. "If there are those who, for this Sūtra, can give a small portion of their wealth as alms, they in effect give others all of the seven treasures, which include gold, silver, vaiḍūrya, conch shell, emerald, coral, and amber, filling up the Three-Thousand Large Thousandfold World. Furthermore, if there are those who make offerings to this Sūtra, they in effect make offerings to the entire true Dharma store. 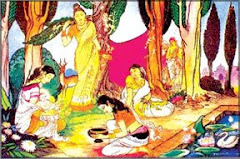 If there are those who would present the superb seven treasures as offerings to the past seven Buddha-Tathāgatas: Vipaśyin, Śikhin, Visvabhū, Krakucchanda, Kanakamuni, Kāśyapa, and Śākyamuni, who were Arhats and Samyak-Saṁbuddhas, the quantity of the merit they would achieve can never be known by measurement. Similarly, if there are those who make offerings to this Sūtra of the Infinite-Life Resolute Radiance King Tathāgata Dhāraṇī, the limit of their merit can never be known by measurement. As in the water of the four great oceans, the number of drops can never be known. "If there are those who copy this Sūtra of the Infinite-Life Resolute Radiance King Tathāgata Dhāraṇī, make offerings, uphold it, and read and recite it, the limit of the virtue they have achieved cannot be known by measurement. If there are those who copy this Sūtra of the Infinite-Life Resolute Radiance King Tathāgata Dhāraṇī, the place where they are has the status of a treasure pagoda containing the relics of the true bodies of Buddhas. That place is worthy of paying respects and making obeisance. If there are sentient beings that have heard this Dhāraṇī, they will never again assume unfortunate life forms, such as birds, four-legged creatures, or multi-legged creatures. 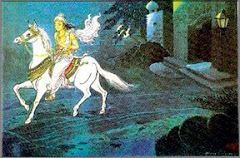 They will swiftly attain anuttara-samyak-saṁbodhi, from which there will be no regress. "Furthermore, if there are those who have accumulated the seven treasures such as gold, silver, vaiḍūrya, conch shell, emerald, coral, and amber, piled up as a wonderful high mountain, can give all away as alms, the quantity of the merit they have achieved cannot be known by measurement. Similarly, it there are those who, for this Sūtra of the Infinite-Life Resolute Radiance King Tathāgata Dhāraṇī, can give alms, the limit of the merit they have achieved also cannot be known by measurement. Furthermore, if there are those who copy this Sūtra of the Infinite-Life Resolute Radiance King Tathāgata Dhāraṇī and make obeisance and give offerings to it, such individuals in effect make obeisance and give offerings to all the Tathāgatas in the Buddha Lands in the ten directions. There is no difference." By cultivation accomplish the power of almsgiving. 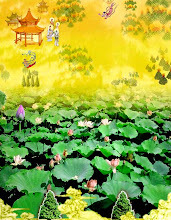 By virtue of the power of almsgiving, one attains Buddhahood. One will swiftly become the teacher to gods and humans. By cultivation accomplish the power of observing the precepts. 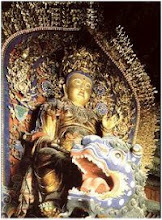 By virtue of the power of observing the precepts, one attains Buddhahood. By cultivation accomplish the power of endurance. 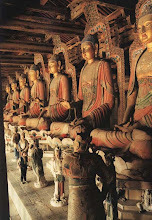 By virtue of the power of endurance, one attains Buddhahood. By cultivation accomplish the power of energetic progress. By virtue of the power of energetic progress, one attains Buddhahood. By cultivation accomplish the power of dhyāna. By virtue of the power of dhyāna, one attains Buddhahood. By cultivation accomplish the power of wisdom. 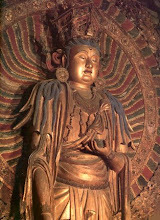 By virtue of the power of wisdom, one attains Buddhahood. 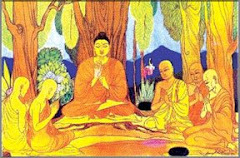 After the Buddha had pronounced this Sūtra, the great bhikṣus, Bodhisattvas, gods, humans, asuras, gandharvas, and others in the assembly, having heard what the Buddha had said, greatly rejoiced. They all believed in, accepted, and reverently carried out the teachings. *This mantra is copied from the Digital Sanskrit Buddhist Canon on the website of the University of the West. Although the phrases in parentheses are not present in Text no. 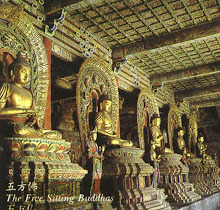 937, in the Chinese Canon, they are included here because the Buddha says that this mantra is composed of 108 syllables.